Park Forest, IL-(ENEWSPF)- Village Manager Tom Mick covered the basics and the seasonal in his report to the Village Board Monday night. There’s a relaxed meeting schedule in December, the Holiday Tree Lighting Ceremony is coming up, flags are at half-staff for 30 days to honor former President George H.W. Bush, and there’s something called 100 Pretty Purses you’ll want to explore. The annual Holiday Tree Lighting Ceremony and festivities are set for Friday, December 7th. The lighting is slated for 6:30 PM on the Village Green. Prior to that there will be festivities in Dining on the Green beginning at 5 PM. Residents are encouraged to check the Village website for more details in the days ahead. The Park Forest Veterans Commission is hosting its 4th Annual 100 Pretty Purses Female Veterans Recognition Event. It will be on the afternoon of Saturday, December 8th from 2 to 5 PM at Dining on the Green. Any female Veterans in the community who would like to participate can RSVP by calling the Veterans Closet & Resource Center at 748-2829 or you can give me a call at Village Hall at 748-1129. 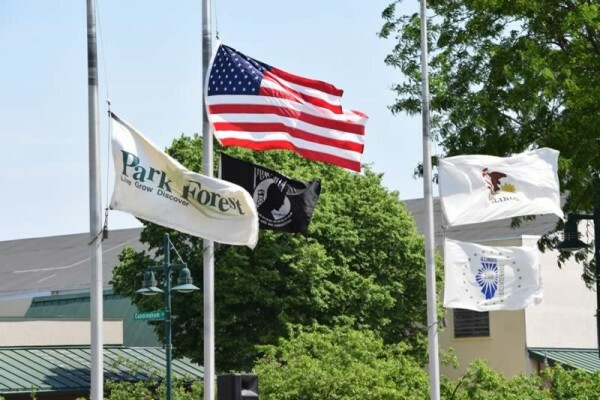 The flags at all Village facilities will be at half-staff over the next 30 days in memory of President George H.W. Bush’s passing over the weekend.